The 2019 Results are in! Another one is in the books! Go to the Results tab above to see the 2019 Results. The plaques are currently at the engraver getting done and will be sent out soon. Congratulations to all the winners. Second place certificates will be going out shortly also. Thanks again to everyone for making NCQP and The Carolina Weekend a spectacular success! Hope everyone has been thinking about their planned activity for this year and are ready to proceed. Its only a short time to go! You’ve probably noticed some changes to the scoring of digital QSOs. They are worth 5 points now. A big incentive to get on this exciting mode. This should stir up some interesting results in the mixed categories for those who make use of Digital extensively. We’ll see how it goes! Speaking of Digital, there have been a number of questions concerning the new WSJT-X (FT-8) software in the new “contest” mode recently added. Unfortunately, state QSO parties are not yet supported. After much research and discussion by our committee I’ve been asked not to recommend this mode be used by our digital ops. I’m not against any legal digital mode be used in NCQP as long as the QSO exchange requirements be met. Unfortunately, as I understand it, WSJT-X can’t do it, at least not yet. Maybe 2020 will be the year. I’m recommending the “old fashioned” PSK and RTTY for now. Please pass the word to everyone you know to get on the air sometime Sunday, Feb 24 from 10am to 8pm and help put North Carolina on the radio map. Call CQ as much as you can, or dare, there will be plenty of folks out in the either looking for us. And turn in your log when you get done. As a bonus, work the SC chairmman Dave Edmonds, WN4AFP, on Saturday Feb 23 and me, W4MY, on Sunday, submit your log to both SCQP and NCQP, and your call gets put in the hat for a $200 HRO gift card drawing! Can’t beat that! See you guys on the air! 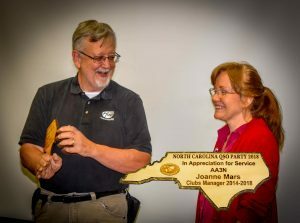 To celebrate five years of North and South Carolina QSO party synergy Chairmen Marty, W4MY, (North Carolina) and Dave, WN4AFP (South Carolina) are teaming up to operate very special bonus stations for the QSO parties this year. The two head honcho’s are teaming up to activate and operate Bonus Station WN4AFP/W4MY as a full weekend bonus. The Chairmen will be the ops. When you you work this bonus it will be either Dave or Marty. (And maybe a helper on digital in NCQP.) In addition to being in the slate of bonus stations, there are some additional perks offered to those that get these guys in their log. Working this bonus station (one QSO in NCQP, and one in SCQP – and submitting your log to each appropriately) puts you in a the hat for a very special drawing. The two state QSO Party committees are sponsoring a $200 ham radio store gift certificate to go to the winner. This is open to both In-State and Out-of-State Single-Ops and In-State Mobiles who submit logs to both North and South Carolina QSO parties. It will be a test of ability and endurance for both Marty and Dave to be QRV from two states over the one weekend. But they are up to it and looking forward to working everyone as a way to express their appreciation for everyone’s support and participation. For 2019 there has been some changes and clarifications in the rules for Mobiles and Expeditions who work from county lines. As before, two counties can be worked in one QSO and logged by each as two entries in the Cabrillo. What’s new is that ONLY ONE county line (thus two counties) can be done this way. Three or more simultaneously is not allowed. You can do this as many times as you want moving to a new county line, just ONLY TWO counties at a time in one QSO. Also, what constitutes being in two counties simultaneously has been clarified. If you are planning an in-state mobile or expedition on a county line, be sure you read these new provisions in the 2019 rules and proceed accordingly. We are planning to strictly enforce these new county line provisions. A County Line is the legally defined boundary between two USA Counties. A marker or sign usually identifies this boundary; however, some County Line markers are located close to, but not on, the actual surveyed boundary. For purposes of contacts for MARAC Awards, the official government County Line marker or sign is deemed to be on the County Line boundary except where there is a Wet County Line. A mobile may (but is not required to) use a more accurate method of determining the location of a County Line boundary, such as a survey map or global positioning system (GPS). On secondary roadways or country lanes, other County Line markers may be found, such as a livestock gate, cattle guard, or a monument placed in the fence line. A change in the composition of the roadway surface may also be an indication of a County Line boundary. When no other means of identifying a County Line is available, these markers may be used. We are requiring that ops that do county line operations keep a record of their method of determining the county line. Taking a digital pic of important landmarks with your vehicle and/or operation in it, GPS screenshots with Google Earth coordinates of county lines, etc. You’re not required to submit this information with your log, but the committee may ask for it as part of our audit we do every year before publishing the final results. Remember, driving and safety are the #1 job of any mobile and expedition! Club station NC4KW, the North Carolina Kilo Watts, was incorrectly listed in the Club / Phone section of our results page. They have been re-posted in the correct category: Club/ In-State/ Mixed/ High Power. Many thanks to Bruce, N1LN (NC4KW) for bringing this error to our attention so that we could make this correction promptly. Congratulations to the Tri-County ARC NC4AR who take the trophy again this year in the Club/ In-State/ Phone/ Low Power category. Our apologies also to John AD8J who was incorrectly referenced as AD4J in our summary writeup. However, AD8J was correctly listed on the Final Results sheet. I don’t know how many saw my interview with Bob Heil on Ham Nation a week prior to the event this past February. I can tell you it’s very different doing it than watching it! I was honored to be on and get the word out. I think it helped because the QSO Party is continuing to grow! Despite band conditions being less than desirable this year, and down right weird acting, activity was up. We couldn’t do it without all you folks! We’ve had some good moves forward this year: a new revamped website, increased presence on social media, better log scrubbing by our 8th committee member Logbot, killer statistical analysis by Marc W4MPS, and a very successful “CAROLINA” Spelling Bee. We can’t forget our great sponsors, new and old, sending in and renewing their pledges this year. RARS continues to provide excellent support as the NCQP host club. I need to remind everyone that RARS budgets money for NCQP over and above what we bring in from the award sponsors. Our Treasurer Greg Seamster, KE4PAX, does an outstanding job of keeping it all straight. He rarely gets any recognition, but surely deserves it. I’m glad to see a good mix of CW and SSB QSOs as it is maintaining about 50/50 in the activity results. Digital is at about 2%. Should there be more? I remember in 2012 when RARS assumed the NCQP helm, everyone was clamoring to include digital. It’s there now. We’ll see if the new FT8 enthusiasm will get that activity up if the software authors perfect a “contest mode”. I have taken the time to look into FT8 from a contest perspective, and think it is an OK mode for NCQP. There are some rumblings about disallowing it because it removes too much human intervention to make a QSO, but I don’t think it is any more so than a CW operator using automation from a logging program to send. We are up 4% over last year with 353 logs submitted and 35,310 QSOs made. Even though that’s the second highest QSO total, the count of logs submitted hit an all time high. I attribute that to more ops struggling with poor band conditions this year than in 2015. We received logs from 94 of our 100 counties. Looking at the trend from 2012 onward, there has been a steady increase in activity which puts us at double our size in those 6 years. Nothing we can do about band conditions, but we are certainly doing it when it comes to enthusiasm! I need to say something about the Spelling Bee and our synergy with South Carolina. Teaming up with our good friends in our sister state has been, and continues to be a consummate pleasure — despite the fact that they put mustard in their BBQ! Seriously, South Carolina chairman Dave, WN4AFP came up with the spelling bee idea and it was a hit. We had 33 successful spellers and that gives each one pretty good odds for the $50 Wireman gift card drawing! Congratulations to those successful participants. It wasn’t that easy, was it? I consider it a great success. There are so many to thank. The committee did a great job. There is not a better group assembled who care and are passionate about making this event the best it can be. My words here don’t give it justice. We’re saying goodbye to Joanne Mars, AA3N, our Clubs Manager committee member. Joanne has served with us since 2014 and has done a splendid job supporting the clubs in regards to NCQP. You’ll still hear Joanne on the air as she spends more time with her other responsibilities, family and NTS traffic handing, which she is an important part of here in North Carolina.